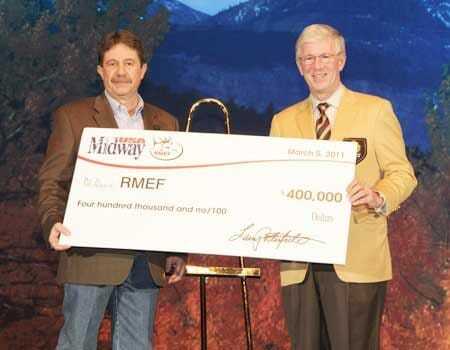 MidwayUSA, a catalog and Internet retailer offering JUST ABOUT EVERYTHING® for Shooting, Reloading, Gunsmithing and Hunting, is pleased to attend the 2012 Rocky Mountain Elk Foundation (RMEF) Elk Camp, their annual convention, as the Official Sponsor of the show. The show will be held February 2-4th, 2012 at the Las Vegas Convention Center in Las Vegas, NV. MidwayUSA believes in supporting organizations whose efforts help restore and preserve the habitats of all hunt-able game. With the recent launch of the elk restoration project in the company's home state of Missouri, it's as important as ever to help organizations like the RMEF achieve their overall mission of conversation, restoration and education of our countries wildlife and habitats. "This is the third year in a row that MidwayUSA has been a sponsor of "Elk Camp"," says Larry Potterfield, Founder and CEO of MidwayUSA. "Each year the show gets bigger and bigger and Brenda and I are excited to see so many people as passionate about wildlife conservation and education as we are." Since 1984, the mission of the RMEF has been to conserve, restore and enhance natural habitats for elk and other game while educating members and the public about conservation, the value of hunting, hunting ethics and wildlife management. In October, the RMEF recorded its six millionth acre of protected habitat for elk and other animals. "Six million acres is an amazing amount of conservation success in a relatively short amount of time," said David Allen, RMEF president and CEO. "Of course, it wouldn't have happened without money, time and talent. That's where our partners, volunteers, members, supporters and banquet attendees come in, and this is a significant milestone we can all celebrate together." For more information on the Rocky Mountain Elk Foundation, please visit www.rmef.org.